With the amazing stretch of summer we’ve been having lately, I was excited to have a wonderfully enticing reason to spend the evening outside eating amazing food. There were so many compelling pieces to last week’s Outstanding in the Field dinner. 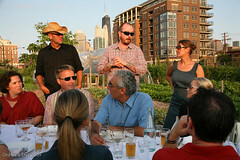 First, the location: City Farm, situated in rapidly changing Cabrini Green, is just under an acre of urban agricultural wonderfulness. The view of the Chicago skyline through the 1000 shoulder high tomato plants (of 30 heirloom varieties) is an interesting juxtaposition – with bunnies scattering about and an apiary in the middle. City Farmers Tim and Joe led us around the farm telling stories of bee gatherings in front of the nearby Starbucks as well as fun facts like the average distance our food travels--1500 miles. The hosts: Jim Denevan, founder, and Katie Oursler, Event Coordinator, have been traveling across the country hosting Outstanding in the Field since 2004. 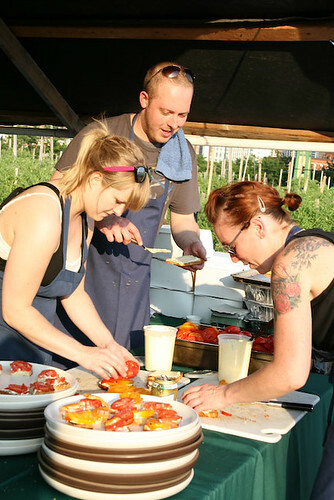 The dinners showcase farmers and their wares paired with awesome culinary talent – giving equal billing to the farmer as the chef, an attempt to elevate the farmer as a cultural figure. The food: Hot Chocolate’s Mindy Segal and her chef Mark Steuer slaved away to bring the 170+ diners a culinary delight of dishes all served family style and placed on the trademark long white clothed table – quite elegant in fact. Everything was mouthwateringly good. The end of the night found me pretending to be part of the waitstaff so I could swipe another table’s remaining pecan pie. And of course, the ingredients: Mindy made an early morning run to Green City Market while vendors packed the trunk of her taxi overflowing with farm fresh ingredients. 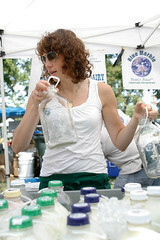 Loading the Blue Marble heavy cream into the back (I moonlight as a Blue Marble sales gal), I enjoyed the full circle experience of providing ingredients in the morning and enjoying them that evening. The drink: As always, there were options apleanty. Death’s Door Spirits were pouring two cocktails – a vodka cobbler with local blueberries and a whiskey smash. Three Floyds was on hand with their brewmaster Barnaby. Piece poured the first beer of the meal, and finally, wine from Black Star Farms, a northern Michigan producer (We hear this is the next big wine region- a weekend road trip is already in the works). 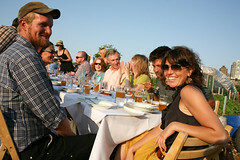 If you can afford the ticket ($200 a pop), I recommend checking out one of the OITF dinners. At a minimum, visit the website (outstandinginthefield.com) and fantasize about being Jim, life on the road, eating all those extraordinary meals.